I’m sure Illinoize will have more about the Fitzgerald stuff this weekend. I’m not sure, however, when I’ll be blogging again because of the holiday and everything that entails, but check for updates. Meanwhile, here is a special Topix Google news feed I put together that searches for Fitzgerald, Blagojevich and Madigan. And here is the Illinoize feed. Also, don’t forget about your July 4th present! Attorney General Lisa Madigan today announced that she will refer her ongoing investigation of alleged illegal hiring practices in various state agencies to the U. S. Department of Justice at the request of U. S. Attorney Patrick Fitzgerald. 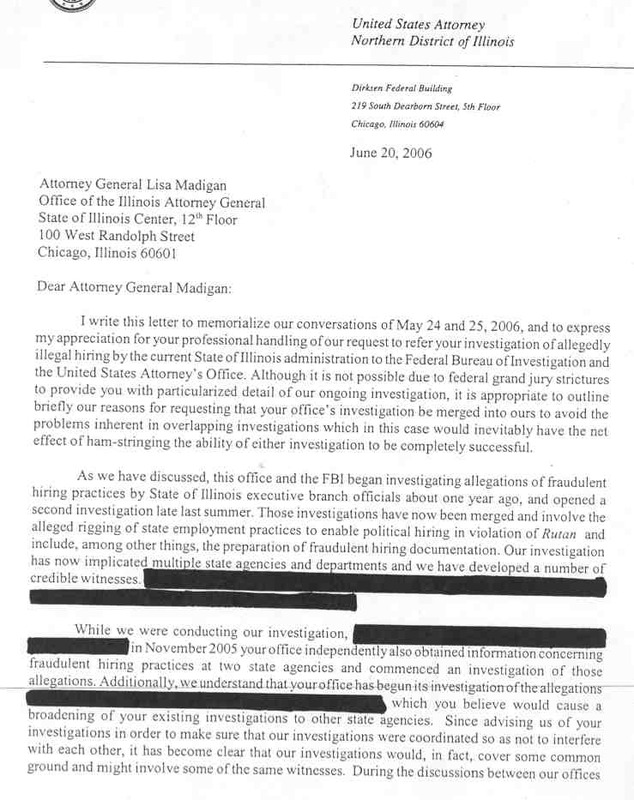 In a letter to Madigan, Fitzgerald cited the problems inherent in overlapping investigations in making his request that Madigan merge her investigation into his. Fitzgerald praised the professionalism of Madiganâ€™s office and her contributions to the investigation. Madiganâ€™s office released Fitzgeraldâ€™s letter today but could not comment further on this or other ongoing investigations. I’ll post Fitzgerald’s letter in a minute or so. …the alleged rigging of state employment practices to enable political hiring in violation of Rutan and include, among other things, the preparation of fraudulent hiring documentation. Our investigation has implicated multiple state agencies and departments and we have developed a number of credible witnesses. UPDATE 3: Fitzgerald goes on to discuss Madigan’s investigation. While we were conducting our investigation [Redacted by the government] in November 2005 your office independently also obtained information concerning fraudulent hiring practices at two state agencies and commenced an investigation of those allegations. Additionally, we understand that your office has begun its investigation of the allegations [Redacted by the government] which you believe would cause a broadening of your existing investigation to other state agencies. It sounds more like tests were being rigged instead of just preferring political allies over non-allies once they got in the pool. Worse, to do so requires a conspiracy–and that this includes essentially all Executive Agencies, a wide ranging conspiracy and could even provide enough for RICO predicates. Gov. Rod Blagojevich’s administration is the focus of an ongoing federal investigation that has “implicated multiple state agencies” in allegations of corrupt hiring, U.S. Attorney Patrick Fitzgerald has confirmed. UPDATE 6: The AP now has a longer story posted. Fitzgerald approved releasing the letter to the public, said Madigan spokeswoman Melissa Merz, and Madigan has agreed to drop her investigations. Merz would not comment further. So, a few “bad apples” are responsible for “very serious allegations of endemic hiring fraud“? Hardly. This statement tells us nothing, as usual. UPDATE 8: The AP has transcribed the Fitzgerald letter from the original pdf format and posted it online in a more readable, quotable format. UPDATE 9: The governor was in the Peoria area today. He was supposed to arrive about 2:30, less than an hour after this story broke. So far, there’s nothing online yet except this WMBD story about him touting All Kids. I fear the story may have broken too late for the locals to figure out what was going on and ask him about it. UPDATE 10: Notice in “Update 7″ how the Blagojevich press release talks about referring cases to the US Attorney’s office and diligently rooting out corruption and cooperating with law enforcement? Also, notice Patrick Fitzgerald’s praise for AG Lisa Madigan’s investigative work in his letter. On a personal note, I know that you have committed significant resources to the efforts to investigate public corruption and have assigned particularly talented attorneys to that effort. I appreciate the approach you have taken in this matter, and will be cognizant, as you suggest, that if we determine that there is criminal conduct which cannot be reached by federal prosecution and for which there is the possibility of state action, to make that information immediately available to you where appropriate. And while I know that you expect nothing more than that my office and the FBI conduct the federal investigation professionally and expeditiously, please be assured that when the circumstances of the investigation permits, I hope to publicly recognize the contribution of your office. My point is, where’s the letter from US Attorney Fitzgerald praising the governor’s efforts to root out corruption? If he doesn’t have one, and can’t get one, then what does that say about the governor’s press release? Do they understand how much they insult our intelligence and do they enjoy it? 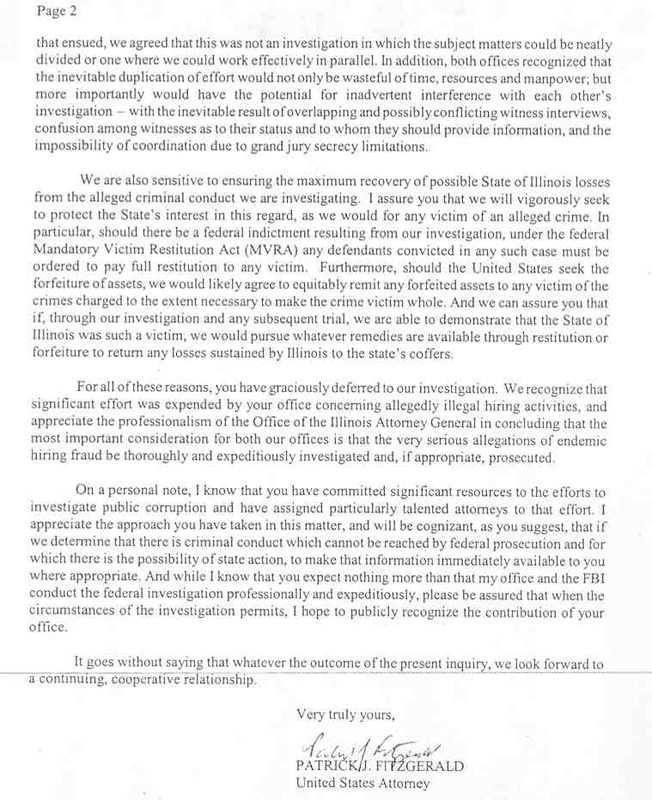 Fitzgerald’s comments, contained in a letter he wrote June 20 to Illinois Atty. Gen. Lisa Madigan, represent the clearest explanation to date of the efforts by federal prosecutors to examine potential wrongdoing within the state’s hiring system. I know it’s a little early, but this is my 4th of July present to you. If it doesn’t work, click here. Since it’s a Friday before a long holiday weekend, let’s lighten things up a little. Imagine the governor in various everyday situations/confrontations that normal people face and then imagine what excuses he would use. Be as creative as possible. Since the governor didn’t deny yesterday that federal investigators have forced 15 state agencies to turn over hiring records, as the Tribune reported, we can safely assume that was the case. We can also safely assume that the governor has a truly marvelous political ability to be absolutely shameless when he’s making stuff up. “I think what you read today is an example of why we have continuously worked to fundamentally change things in state government,” Blagojevich said after a news conference promoting his All Kids health insurance program. He said the edict to gather information shows his administration is trying to stay on top of hiring practices. “We are always making sure that we are vigilant and constantly reminding our agency directors to follow the rules and to make sure that we stay on top of this,” Blagojevich said. The Daily Herald noted the irony in the timing of the allegations. Yesterday’s press conference was designed to kick off All Kids. Ironically, Blagojevich was in the same situation last October, when he first trotted out the All Kids program as a way to help middle-income parents get their children health insurance on the same day the first federal subpoenas were revealed. And Joe Birkett, complaining about a $100 million no-bid contract to a company that employs the guv’s former chief of staff, claimed the investigation count was nine. When asked about Birkettâ€™s comments, Blagojevich dismissed them by saying Birkett needed to lighten up. He’s right about that one, of course. Meanwhile, there was some more bad news. A letter produced in court this week seeks to bolster a claim by top Illinois State Police officers that they lost a vacation provision because they declined to endorse Gov. Rod Blagojevich in his last election. The non-unionized command officers filed a lawsuit in 2004 that claims unionized rank-and-file troopers kept the benefit after endorsing the governor, and the letter written June 14 by the union president reminds members of what their support meant. “I believe that the speed in which we successfully negotiated our recent collective bargaining agreement, the most lucrative in Lodge history, can be attributed to the endorsement of the governor,” wrote L.H. “Buddy” Parker of State Troopers Lodge No. 41. UPDATE: Currie has more. Read it. It looks like President Stroger will step down after all and John Daley will be his interim replacement. Under fire for the leadership vacuum in Cook County government, stroke-stricken John Stroger has decided to resign as county board president on June 31 rather than serve until the end of the year — paving the way for Mayor Daley’s brother to become Stroger’s interim replacement. So, Stroger steps down and his son Todd replaces him on the ballot. Ald. William Beavers will take Stroger’s place on the ballot for his county board seat and Beavers’ daughter will then take Beavers’ city council slot. And the mayor’s brother (who is the son of a former mayor) will take the president’s job until Todd is sworn in (although Larry Suffredin told the Tribune it might also be Commissioner Bobbie Steele). Meanwhile, Rev. Sen. James Meeks isn’t so sure about all this. “If the Democratic Party and if African-Americans are concerned about keeping that seat, then the party and African-Americans must make sure that it … puts its best qualified, most electable person on the ballot,” Meeks said. And John Kass tries to put a big bow on everything in his summation. The wrangling over Stroger doesn’t matter because the mayor is boss. He’ll decide how he wants to run Cook County government. He needs someone black in the president’s chair, as required political counterweight to his whiteness. Call it cynical, but it’s reality. Mega bonus points for the first person who can spot the timing problem in the Sun-Times article. The Tribune reports there are growing concerns about All Kids. “Two days before the launch of Gov. Rod Blagojevich’s signature health-care plan, All Kids, medical groups are voicing serious concerns about the program’s viability and physicians’ interest in participating. At issue is growing dissatisfaction in the medical community with late payments by Illinois’ Medicaid program, a problem that could discourage physicians from taking on new patients under All Kids. Also, dissatisfied doctors may decline to take on new care-management responsibilities for Medicaid patients, a move planned to make All Kids affordable. Still, the publicity appears to be working. The governor claimed early success Thursday with the announcement that 43,000 previously uninsured children had enrolled in All Kids–close to the 50,000 enrollment target the state had set for the first year. UPDATE: Despite what some people are posting in comments, an administration spokesperson just said the rumors that the All Kids enrollment list was padded with KidCare and Medicaid clients is not true. So, unless you’ve got some evidence, please stop. Â· Editorial: In chiding his fellow party members for shying away from discussions and debates over religious issues for fear of giving offense or appearing insensitive to those with opposing views, Obama made a timely, considered statement that would carry weight whether Democrats look to him as a savior or not — and clearly a lot of them do, given the ceaseless speculation about his prospects as a presidential candidate… “Not every mention of God in public is a breach to the wall of separation — context matters,” said Obama. In the context of politics, injecting a real moral dimension matters, too. The Service Employees International Union is increasing its involvement this year in the city’s aldermanic politics. Because of our growing base in the city (100,000 members; 253,000 in SEIU households), we want to work harder to hold the Chicago City Council accountable to the city’s working people. To this end, we will be offering full-day trainings in July to those wishing to run for alderman or work on aldermanic campaigns. In addition to community activists and Local School Council members, all incumbents have been invited to join us for these trainings.